Happy New Year, everyone! We are still on vacation and having lots of exciting adventures in Florida. We love coming to Florida - this is trip number four for us! Out of all our adventures so far this stay, I think this story is the best and happened just last night. Hubby sometimes gets really bad migraines (especially when he eats gluten, which has been difficult to avoid during this trip, but we're working at it). He got one yesterday evening, which was New Year's Eve. To get some quiet from us, he left our hotel room and went downstairs to a Starbucks to drink lots of coffee, which seems to help. That left me and the Little Man alone to figure out dinner. Now the Little Man also has a bit of a cold, so he is more picky than usual and all he wanted to eat for supper was a banana. I did not have a banana. This was an emergency. We both needed to eat supper and it was pretty cool and windy outside. I called room service and even though they apparently serve bananas for breakfast, there were no bananas to be found in the whole hotel! Normally, since two of us would be around to watch him, only one of us would have to venture out, but being alone, I had no choice but to get the Little Man bundled up and head out in search of a banana. I was desperate for a banana. I would pay good money for a banana. Since it was NYE night, we were staying on the A1A strip (for those who know the Vanilla Ice song, that's "beach front avenue!"). It's a busy strip of hotels by the beach and not much else other than drunk tourists in bikinis. Where to find a banana? By now it was after 7pm - way past the Man's supper time and not too many choices. We ventured out with the stroller and I did the most logical thing I could think of - walk to the next hotel over and hope for the best. The neighbouring hotel was a Ritz Carlton. We were greeted at the door and had the doors held open for us. When the Little Man saw the lobby, he said, "wow!" Wow, yes indeed! It was quite beautiful. I waited patiently at the front desk for someone to serve me. Jeffrey, his name tag said, came to my aid. 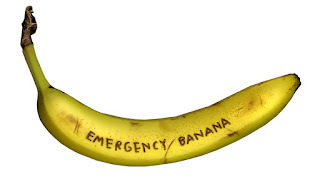 "This may sound weird, but I really need a banana," I said, with all seriousness. "It's an emergency," I added. "A banana? Sure, no problem. I can get that for you!" He didn't look at me like I was crazy, much to my surprise, and he asked a bellhop to fetch us a banana. While we were waiting, he pulled out a wagon full of packaged toys and asked if my son would like to select one. Oh, of course. Let me see. Feeling a little awkward about all this generosity, I let the Little Man out of the stroller to take a look. He picked up a few, but then somehow, which his special laser vision skills, he found a train set. He happily selected the train set and sat back down in the stroller. Suddenly, my knight in shining armour arrives, with not one, but two bananas for us. I was so happy, I almost cried with joy. I thanked Jeffrey profusely and wished him a happy New Year. We left the hotel with our train set and bananas and dinner was saved! Best lesson learned in the last hours of 2012: if you need a banana like it's an emergency, walk into a Ritz Carlton hotel. Also, a few hours later, Dada came back to the room in much better shape. We put the Little Man to bed and then watched the ball drop in Times Square on TV, like we do every year. Then we admired the fireworks set off all over the beach and the city from the comfort of our hotel room. It was lovely.